The best thing to happen to skin since water! 100% Pure, Natural Vegetable Fibre. Deep cleansing and naturally moisturising. 100% Biodegradeable and pH balanced. Suitable for even the most Sensitive Skins. 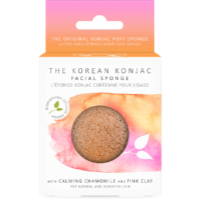 The original and best Konjac Sponges with the purest Konjac and mineral rich extracts. Deeply cleanse, exfoliate and detoxify skin for a radiant complexion. 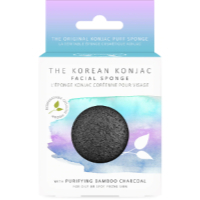 Gentle enough for sensitive skins and babies, these pure Konjac Sponges are the ultimate in natural, effective skin care. 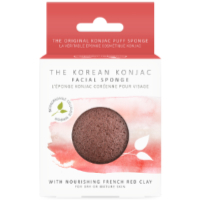 The pure Konjac is free from chemicals, colouring, additives and irritants. 100% biodegradable and fully sustainable, this moisture rich plant fibre is mixed and handmade into sponges with natural water filtered through volcanic rock. The Konjac is grown on the fertile volcanic hills of Jeju Island in South Korea. A UNESCO world heritage protected site, Jeju Island is renowned as a pristine area of outstanding beauty, reputed to have some of the purest water in the world. Packed with minerals and antioxidants. 100% free from impurities and pollutants. 100% cruelty free and certified vegan. Environmentally Safe Kind to The Environment and Skin. The Konjac Potato or Konnyaku is a perennial plant native to Asia, and can be found growing wild at very high altitudes. A totally natural food source, Konjac is 97% water, rich in mineral goodness and low in calories. Naturally alkaline, Konjac is pH neutral which leaves skin perfectly balanced. First discovered in the Indochinese region, Konnyaku has been used in Korea, Japan and China for over 1,500 as medicine, food, a dieting aid and as a beauty product. 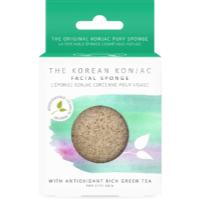 Highly prized for its health giving properties the Konjac Sponge was originally created for delicate baby skin.